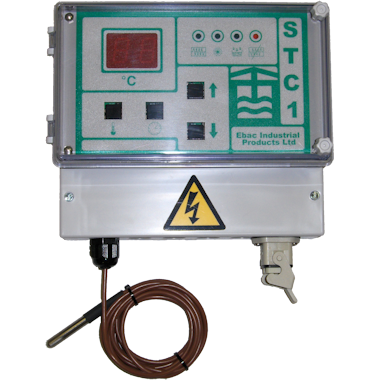 Ebac Industrial Products recommend the STC1 Controller is mounted outside the drying kiln in order to allow easy monitoring and adjustment. Note:- the fixing points located on the underside of the control box, 1 "hook" type positioned towards the top, and 2 holes located at the bottom of the controller. Using a suitable wall fixing, secure the single top mounting first. Remove the 2 screws retaining the front cover, identify the 2 remaining fixing holes. Ensure the control box is level, and mark through these fixings onto the wall. Using suitable wall fixings secure to the 2 remaining points to the wall. Further information regarding Kiln design and installations can be found within the Timber Dryer manual.